OSWEGO, NY – NRG Oswego Power has joined with the many individuals and businesses supporting the Oswego Salvation Army “I Believe” Capital Building Campaign. NRG Oswego Harbor Power employees recently held a Charitable Giving Volunteer Day and cooked and served breakfast to clients at the Oswego Salvation Army. 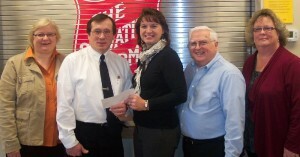 Standing from left are: Mercedes Niess, Salvation Army Advisory Board member; Captain Kenneth Hayes, Oswego Salvation Army; Donna Moonan, regional administrative assistant at NRG; Paul Santore Salvation Army Advisory Board chair; and Barbara Bateman, Salvation Army Advisory Board member. The Oswego Salvation Army is part of the International Salvation Army organization, which is an evangelical part of the universal Christian Church. The local citadel provides food, education, services and spiritual support to the local community. Anyone interested in information about programs or serving as a volunteer at the Oswego Salvation Army can call (315) 343-6491.